Have you noticed that supermarket furniture polishers aren’t actually improving the shine on the wood in your home? Or maybe you’re fed up of the noxious fumes that aerosols produce? It’s been proven that commercial polishers leave a residue on the surface of your furniture, causing a build-up of product. There just bad news all around! Why not try a homemade, completely natural cleaner? Our homemade furniture polish is great for getting a real shine on your wood, without causing any damage. It has 4 ingredients: half a lemon, olive oil, vinegar and essential oils – we bet you have most of these already! Give this recipe a go and save yourself a fortune. Place a funnel in the neck of your chosen bottle to reduce spills. Squeeze the juice of half a lemon into the bottle. The funnel should catch all of the pips. Pour in 2 cups of vinegar. Shake to combine the mixture. Spray onto a microfibre cloth and buff onto furniture using circular motions. 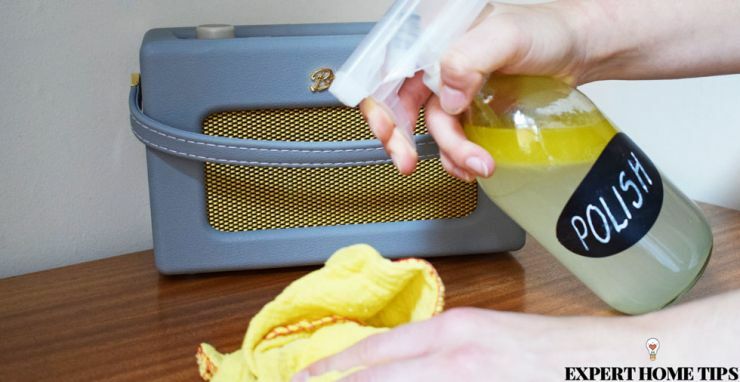 Lemon juice is perfect for cleaning furniture, with a low pH and antibacterial qualities. The combination of the juice and the lemon essential oils will produce a beautiful, clean aroma in your home. The olive oil will give the wood moisture while adding a beautiful polish, and vinegar is a natural disinfectant.